With Halloween quickly behind us, I am in full holiday mode. First up…my thanksgiving table. Even though I will not be hosting thanksgiving this year, I love to decorate the table as a simply way to celebrate the upcoming holiday. Plus…it is so pretty to see the table all fancied up! 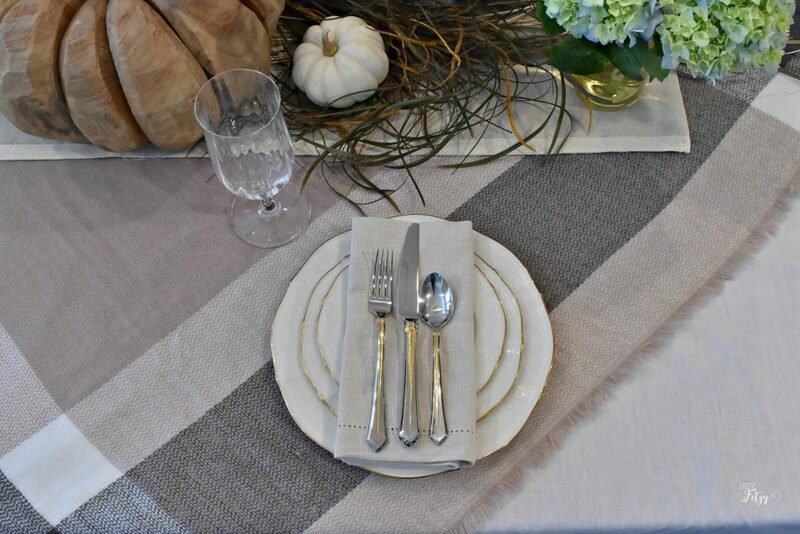 All week long some of my blogging friends are sharing their thanksgiving table inspiration. A special thank you to Chloe of Celebrate and Decorate for organizing this fun blog hop. You can click on the blog links at the bottom of this post to see all the beautiful thanksgiving table inspiration! The first thing I wanted to incorporate into my holiday table was this china and flatware. They were received as wedding gifts more than two decades ago when I said “I Do” to Fitzy. We were just kids back then when we started this amazing journey together. Lots of ups and downs later, he is still one of my favorite people in the whole wide world. So anytime I get to pull out this china (which unfortunately isn’t very often), it reminds me of a our special day. The china is still simple and classic after all these years! I found this wooden pumpkin a few years back at a local store. It jumped right into my cart and wouldn’t let me leave without it. It is big, heavy, and glorious! I love it! To keep it simple, I layered a fall scarf over my table. I love the visual interest it creates while incorporating a little bit of color. Grocery store flowers add a special touch along with the nature items included. Keeping it simple is my new motto since moving across the country earlier this year and I love the simpleness of this table. This is my favorite time of year and I can’t wait to finish decorating for the holidays! Now prepare to be inspired by going to check out these amazing thanksgiving tables. Love your scarf layered over your table for a runner, it seems to be a theme this week! Gorgeous wood pumpkin, mixed with your pretty hydrangeas for a centerpiece too! Thank you Mary! I guess nothing says fall like a great scarf. :) So fun to incorporate them into our home decor! 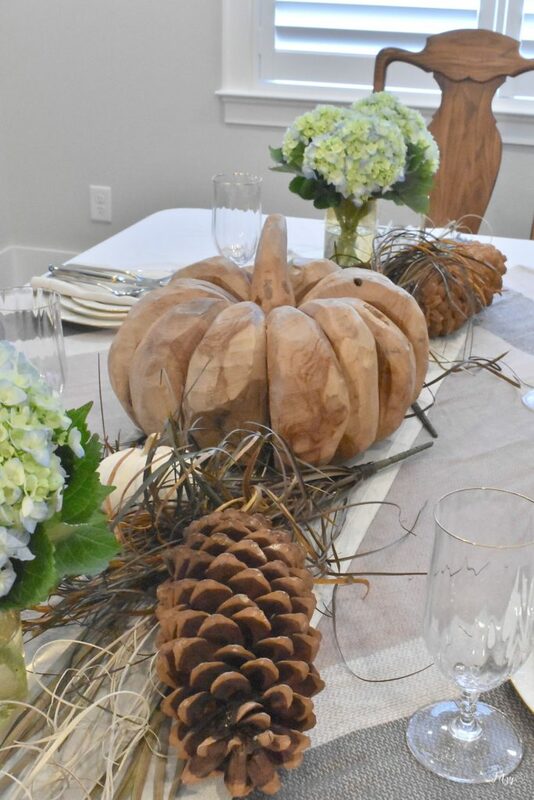 I love the simplicity of your table using natural elements with the wooden pumpkin and pine cones and straw. Adding the pop of blue hydrangeas added color and beauty. I love fresh flowers for any occasion. Hi Bonnie, Thank you for stopping by. It is amazing the power of fresh flowers to brighten any space! Sometimes simplicity is the most lovely. Your table setting was delightful; I loved it! Also loved browsing your blog. Hi Wendy, Thank you for stopping by. Hope you have a fabulous holiday season with your family! 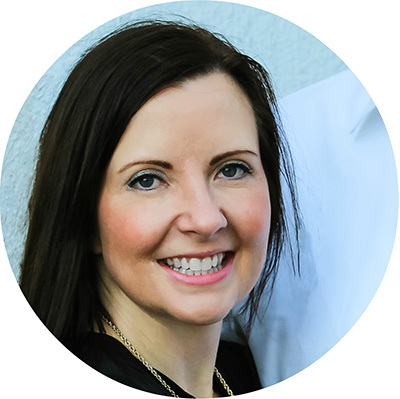 Tammy, I've spent about 20 minutes getting to know you better before even reading this post. It's a pleasure to make your acquaintance. I remember your home tour on Stacey's blog, and have seen you featured on link parties, but it's just now that the dots are connected. I especially enjoyed reading about your family (thankful for your son's service! ), and your recent move to Nashville. Which brings me to your lovely table. Nothing draws me in more than using cherished and vintage items, such as your china and flatware. The memories held from those early years can come rushing back with just a simple task as setting a table. The second thing I really admire is your commitment to simplicity in not just this table, but in how you're living in your new location. It's a lesson I could certainly bear repeating, and you could certainly deliver some tips on lessons learned in that journey. Thanks so much for being a part of this blogging experience. I'm adding your blog to my email list so as not to miss future posts! Hi Rita, Thank you for your kind words. You truly made my day. It is such an honor to be able to share my home and heart with readers. I have enjoyed working on these tables capes and can't wait to see what you come up with next! Hope you have a fabulous holiday season! Simple and stunning! The scarf looks fabulous with the huge pinecones and chunky pumpkin! Thank you Jenna! I have a serious crush on that chunky pumpkin and love including him in my fall decor! Hope you have a fabulous holiday season! I love that wooden pumpkin. It's so unique and has a great natural feel to it. Looks like it has a great story behind it. Like someone's grandfather carved it from an old piece of wood on the family farm. Your plaid scarf is a great idea. Pretty color, pattern and texture to serve as the foundation for your tablescape. Thank you Carol! It really is a magical looking pumpkin that I believe is just delightful. You are correct! It looks like something someone may have carved. Simplistic is beautiful and your table is no exception. I adore the wooden pumpkin and the use of a scarf as a table runner. The "memories" china is lovely and I know you have that special feeling each time you use it. It is always fun to blog hop with you! Hi Kari, Absolutely...this has been a fun blog hop! Can't wait to see what every one comes up with next! Pretty, and simple, the hydrangeas next to the large pine cones is a nice touch to add to the rustic pumpkin and elegant china. Lovely! Thank you Carol! I loved the little touch of color the hydrangeas brought to the table. Made for an interesting combination of rubric and elegant! I absolutely loved the scarf draped in the middle of the table versus a traditional runner. I am loving black and white buffalo check this season, and this was reminiscent of that patter. I also thought your pumpkin centerpiece was unique and a nice departure from all the white we have been seeing this year. 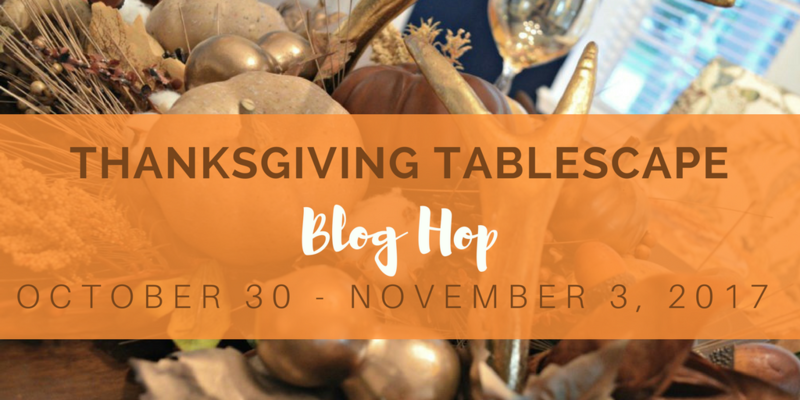 I am thankful to have you as part of my tablescape blogging tribe! Hi Chloe, Thank you for creating this special tablescape tribe and for inspiring all of us to bring our ideas to the table. I feel so thankful to be a part of this group! 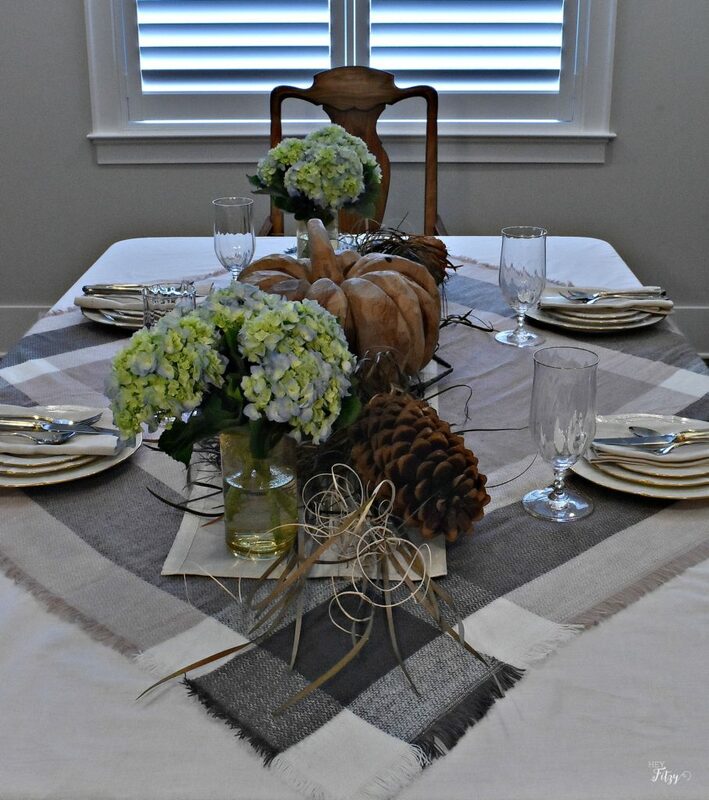 Tammy, I love your simple Thanksgiving table! So many in this blog hop are using scarves this year, and I really love the one you're using. Beautiful dishes and I love the pop of your hydrangeas! Thank you Carol! I didn't realize scarves were going to be so popular. But they really are a fun decor option for fall. The scarf is lovely. I see using a scarf has been popular. Love the pumpkin. Wonderful natural elements look amazing. There is nothing like wonderful hydrangeas. A pleasure joining you on this blog hop. Happy weekend. Thank you Linda! I love hydrangeas any time of year and try to find simple ways to include them in my decor! Hope you have a fabulous holiday. Such a pretty tablescape with it's subdued colours and natural centerpiece. Love that pumpkin and how you put the pine cones and vases of flowers around it. That scarf is wonderful and I like how you put it on an angle -I'm definitely going to try using one of my fall scarves as a table overlay! Your flatware looks lovely as an elegant contrast to the other more rustic elements - a terrific wedding choice! Thank you Lori! I love incorporating scarves into my fall decor. Such an easy way to add a pop of color. After all these years I still adore our wedding flatware and china. I picked it for its timeless appeal and so glad I still love it! Simple and beautiful! I love seeing out of the ordinary textiles on tablescapes and this scarf is very pretty. I had to laugh when you said the turkey jumped into your cart. I use that excuse often when my daughters tell me that I shouldn't buy any more "table stuff" Enjoy the holiday and it was fun hopping with you again. I think scarves are perfect for layering on a table! I love your chunky pumpkin, it makes for a great centerpiece! Using your wedding china and flatware makes your table full of sweet memories! I have enjoyed blog hopping with you! Thank you Pam! This has been such a fun blog hop. I can't wait to see what everyone comes up with for the next holiday! Tammy, your table is both elegant and beautiful! I love your pretty china! It has been so much fun blog hopping with you! I hope you enjoy your week! Thank you Shannon! It really was a fun blog hop! I can't wait to see what everyone does for the next one! Simplicity is always a good idea! Your wooden pumpkin is amazing and your tablescape looks warm and cozy. Hi Donna, Thank you! Decorating the table is the first step in building my holiday excitement. Love this time of year! Tammy, I love a simple table also and yours is beautiful! I would have purchased that wood pumpkin too because I have never seen one like it. I love your plates. They are beautiful and you can change them up for every occasion. Great job as always! Thank you friend! It really is amazing how many different tables I have created over the years using the exact same china. They are classic and go with just about anything.